Glenda couldn't believe her eyes. It was just...gone. A Program Specialist for Consolidated Nuclear Security, Glenda Roberts had just arrived for work at the Pantex Plant outside Amarillo, Texas. It was bright and it was early. And what had been just another Monday had suddenly become quite manic. She was missing a diamond. And not just any diamond. As if there were such a thing. No, this was something special, the marquise diamond from her 25-year anniversary ring - a gift from her late husband. It was sacred. Somewhere between her car and her desk, it had simply come off. She didn't know where. And though its significance to her was largely sentimental, its material value was substantial. She feared - no, she assumed - she would never see it again. One week later, another Monday, Glenda was again in the cafe for her morning tea. "Guess what I found," Paul said. 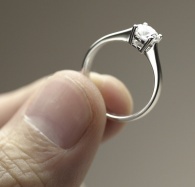 "My diamond," she replied jokingly, not really believing it was possible. But it was more than possible. The lead cashier for Southern Foodservice Management at the Main Cafe in Glenda's building, Paul Bittner had been cleaning that morning - just going about the every day business of a corporate dining professional - when he moved a container and spotted the diamond. When he put it in her hand, Glenda was thrilled. Naturally. She offered him a finder's fee, but he wouldn't accept. Naturally. A thank you was all the payment he required. Now, I know what you may be thinking: Sounds a little too-good-to-be-true. But there really is a very simple explanation. Paul is a good man. And not just any good man. As if there were such a thing. No, this one is something special, which is to say, a Southern employee doing what Southern employees do every day in communities all across the country: giving that Something Extra and making a real difference in the lives of others.